How to search for folders that do NOT contain a particular file? Is there a modifier key to cause 'Search Again' feature to create a new tab (search)? Can the 'New Search' feature be configured to use the current tab instead of the last executed search? 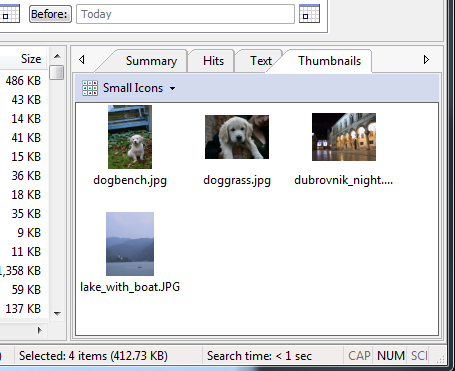 Will it be possible to add an image viewer to Filelocator pro? When I search an image name (p.e. a screenshot name) I have to click on all files found to find the correct one. There is no possibility to see in a future release the real image? To see the real image you'll need a dedicated image viewer. FileLocator Pro is primarily a search tool. Oh thank you. I totally forget this thumbnail viewer.